The hen is Wario's pet chicken seen in Wario Land II. She is notable for being one of the few things that Wario expresses love for other than money. The hen appeared in the first Story of Chapter 2 (the SS Tea Cup): Return the hen to her nest. The cutscene before this stage depicts the three Pirate Goom soldiers of the Black Sugar Gang dashing away with Wario's Treasures and startling the hen. Wario follows closely behind in pursuit of his loot. However, when he sees his pet fly away, he temporarily stops his quest, as he loves his hen even more than he does money. He soon finds the hen in the outskirts of his lawn and he manages to fight his way through the Roosters and other foes to return the hen to her nest. It is there that she lays an egg. 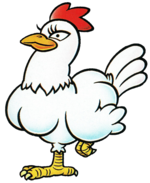 The Roosters are also notorious for being very protective of the hen, as they will charge at Wario when he is holding her, but otherwise only attack when attacked. The hen reappears in the Modern version of the Game & Watch game Fire Attack in Game & Watch Gallery 4. In the game, the hen will climb up the stairs into Wario's house. If Wario stands behind the hen, she will lay an egg worth five points. If he attacks her, like the Bob-ombs that also climb up the stairs, she will not give him any points. She also appears in a sequence that appears if the player selects Fire Attack yet does not actually start it, where she is strutting around a Tomato field as Wario is tilling the land, but then flies away after seeing a Bob-omb rolling up to Wario from behind, clearly sensing the danger, only for Wario to be sent flying by the explosion. ↑ Wario Land II instruction booklet, page 17. This page was last edited on April 18, 2019, at 00:38.